Join us on this 3 day escape to beautiful Muskoka. Our getaway features a wonderful Play at the Gravenhurst Opera House, deluxe accommodation at the fabulous Casino Rama hotel, and a lovely boat cruise on Lake Muskoka! Casino Rama Resort:At the award winning Casino Rama Resort, they believe in providing an experience that makes each guest feel right at home. With 289 all-suite rooms, you’ll enjoy spacious comfort, impeccable service and deluxe amenities including access to the indoor salt water pool, hot tub, eucalyptus steam room, sauna, and adult-only fitness facilities. 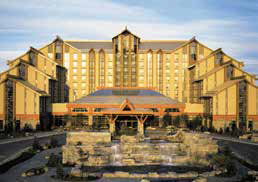 Our hotel is complimented by a world class Casino, Rama is Ontario’s premier entertainment destination. They offer a complete entertainment experience with more than 2,500 slot machines, more than 110 table games, 10 unique restaurants and a world-class, 5000 seat Entertainment Centre.